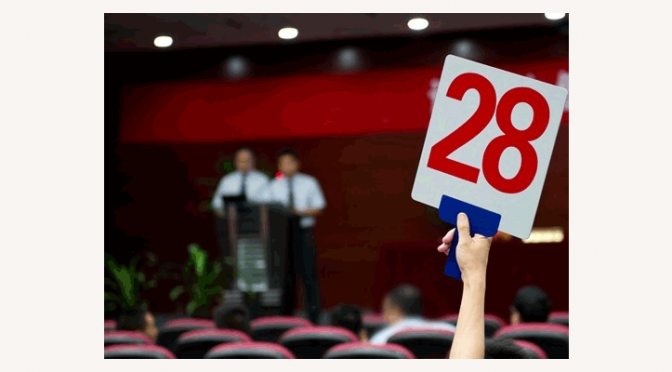 Many first timers at an auction are amazed by the skill of an adept auctioneer. The fast-talking style of auction calling is one of the most widely-recognized in the industry, thanks to its uniquely American heritage. Though it is uncertain where exactly the fast-talking style originated from, it is thought to be traced to the tobacco leaf auctions that spread from Virginia to other states after the Civil War. The style itself is a mixture of proposing bid increments with various filler words in order to lull the bidders into a rhythm of call and response. Take a listen to some of the nation's most accomplished bid callers and it isn't difficult to see how the driving cadence of their voice could hypnotize bidders. The job of the auctioneer is to sell the lot for the highest price possible. As such, the fast-talking style developed to encourage the competition in the room. Unloading numbers and filler words at a rapid pace drives up the energy of everyone looking to walk home with the item. The quickness creates a sense of urgency while the monotone ensures that the auctioneer can be understood. Together these two elements are meant to engage the observers in bidding wars over a piece. Often, in an effort to drive the competitive spirit, auctioneers will begin to address individual bidders that seem to be very interested in the lot. Pointing and gesturing at individuals as the sale price creeps upward and upward is thought to make them more likely to exceed the limits they have set for themselves. For many, becoming an auctioneer is usually the result of having been raised around auctions. Whether it is was from a relative being in the industry or working on a farm that regularly made money at livestock auctions, it seems for most, early exposure to auctions is what determines their career path. However, for many first-generation auction callers, there are about 50 auctioneering schools across the U.S. that offer courses in how to become an auctioneer. They teach their students not only techniques for fast-talk style bid calling but also the dynamics of the auction industry and how to make a career in the field. Does live auction calling stress you out? Enjoy a more peaceful bidding environment on iCollector.com.